« Happy Mother’s Day Mommies! wow, thats a great idea! the tofu?!?!?! ingenious! Ive never, ever heard of cooking eggs like this before. I kind of feel like I’ve been missing out. They look so good. I’m definitely bookmarking this recipe. Thanks for posting it. That was so sweet of Quay Po to send the yins to your kiddos! Love the pretty colors and it looks like they’re a lot of fun to play with! These eggs look great — would you believe I’ve never in my life had steamed eggs?! They look really flavorful though (love the green onion in there!) and I’d love to give them a try. Hope you’re enjoying the nice weather with your family! I love steamed egg custard and you’re totally right..timing is everything to make the steamed egg custard not too puffy/wrinkly. My mom taught me the trick but it was still a hit and miss for me. I don’t have any eggs at home now (bummer!) but when I do, I’ll definitely make the steamed egg custard. Have a great day! yum! what would you do for a veggie version? Hmm…that’s a great question, Lynn. Since eggs are the main ingredient, maybe try using egg whites only? I’ve never tried that so I’m not sure if it’ll still work. 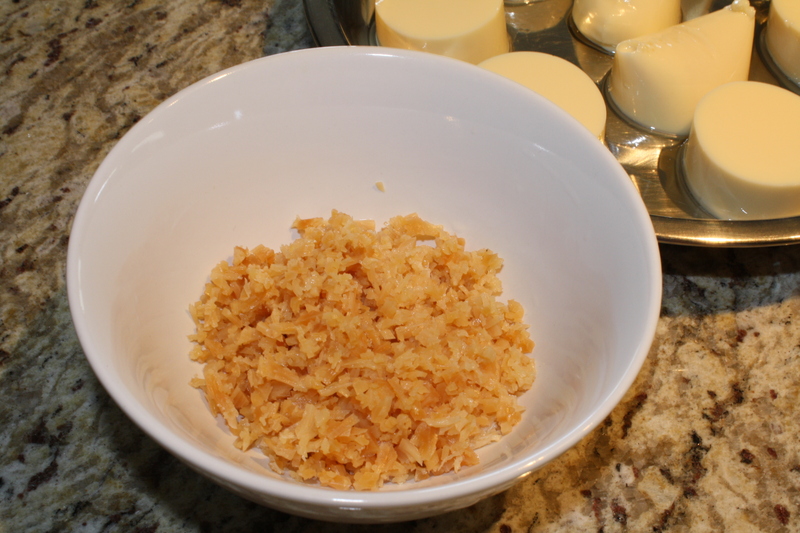 Don’t use the dried scallops, but just use plain water. 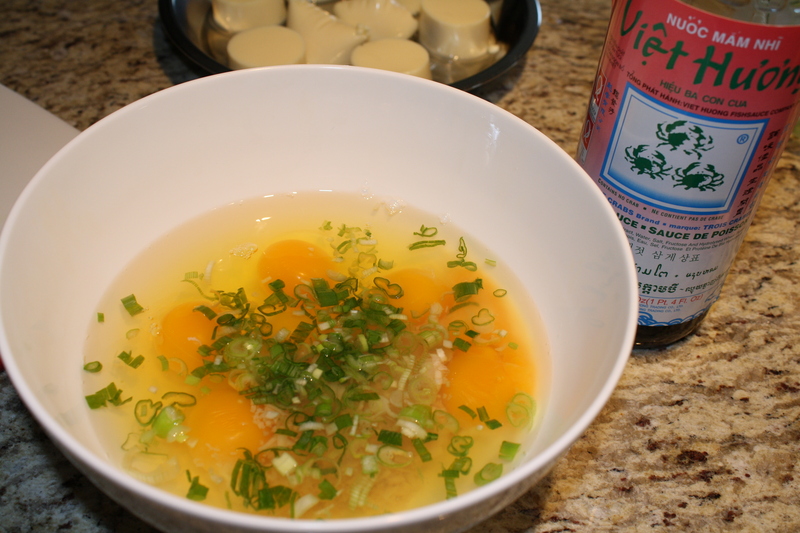 Instead of fish sauce, use soy sauce or sea salt. Hope that helps. I strongly urge you try a version with the dried scallops also, they make this recipe so much better. LeQuan, If you see me now, you would have notice my neck has grown a few inches longer because I have been stretching to look out for your new post hehe. I love the photo of your Mum teaching your kiddies how to play the “Yin”. A great pic of Grandma bonding with them. Oh yes, if you ever visit Malaysia, please allocate a day or two to spend with me. I am sure we will have lots of fun “yakking”, eating and shopping!! If you do not mind my humble place, you, Gary and your kiddies are welcome to stay with me. Since Nick has moved out to stay on his own, I have a spare room now. When my Quay Lo saw the picture of the dish and read the recipe, he immediately recognise that my mum has cooked this dish before but in a slightly different way and she did not use dried scallops. This is a delectable healthy dish. Your version looks very scrumptious and I got to try it. Suddenly I feel I am not on the ground but floating because of all the compliments you shower on me. Reiterating what the humurous Mary Moh had said to me, would you like to hold on to my leg and have a free ride?? LOL! Jokes aside, I appreciate your friendship very much and feel blessed to have found you! Much love from this Quay Po. Oh Quay Po, you are just too too kind! I don’t know if you’ll be able to handle just me, let alone my 2 holy terrors. Haha. Thank you for your kind offer, I’m so touched. Same goes for you and Quay Lo ok? Make sure you let me know if you ever visit Canada. Yes, this is a very popular Chinese dish and so many versions huh? Now you know why I laughed when I saw the picture on you FB. I was half way thru posting this post at that time. You and Mary are such a hoot. You two totally crack me up. Mary can have the right leg, I’ll take the left. Wheeeee…..!!!!!! Nothing to float about though, everything I say about you is true :-D. Sincerity wins hearts, my dear friend. You’ve definitely won mine :-D.
And just what do you mean by you “were” a picky eater? I guess some things don’t change, huh?!? heehee. I know you mentioned that your steamed egg with tofu and dried scallops is an easy dish but I had to reread it to figure it out. The actual entire finished steamed dish is so beautiful and I think a very clever idea. My mind is wandering to all the different ingredients you could use for flavorings…. 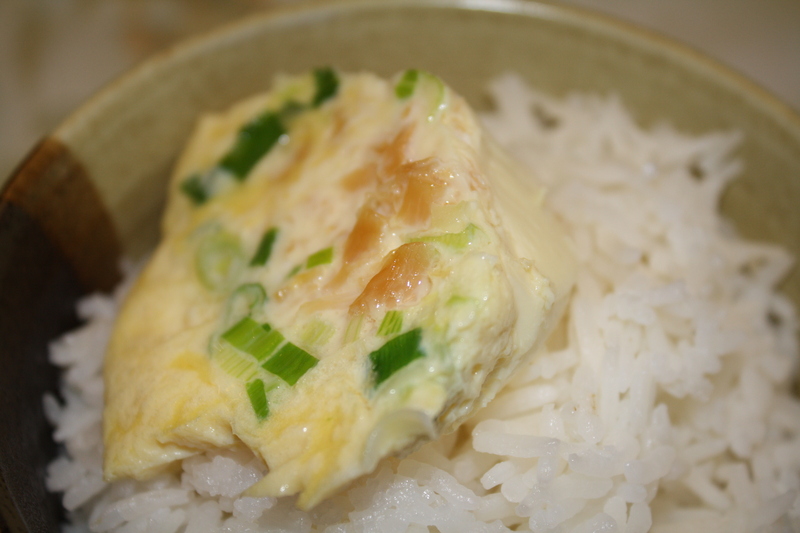 Your last photo of the eggs with the rice looks just delicious and very tempting! No need to apologize! I totally understand that summer in Canada is over in a minute so you should definitely enjoy it while you can. How nice of Veronica to send your kids little gifts. I’ve never heard of yins before but I hope they provide hours upon hours of entertainment for the little ones. 🙂 I agree with Anna – bloggers make the best friends! PS – I am going to try these steamed eggs…I have never heard of such an amazing thing but if your kids eat it, maybe mine will too! Hope you are having a great week and still enjoying the nice weather. OMG, I love that game! It certainly brings back memories. I used to be very good at it & often made Captain of the team. Hahaha! Then I tried playing it again when my son was in Elementary Sch but I couldn’t even pass 3 kicks. LOL! So embarrassing! I think you will love Singapore. They have this hot plate spicy egg tofu dish that is super super super super fantastic. I have no recipe for that…I wonder if Quay Po has it? Btw, her “name” cracks me up. LOl. This looks like such a fun game to play with the kids! Enjoy all the warm weather activities with them! I need to try the steamed eggs, those look delicious for sure! What fabulous bright fun toys for your kiddies – I am sure they will play with them for a long time. It’s incredible the friendships we build through blogging and then to see those same friends on other blogs too. 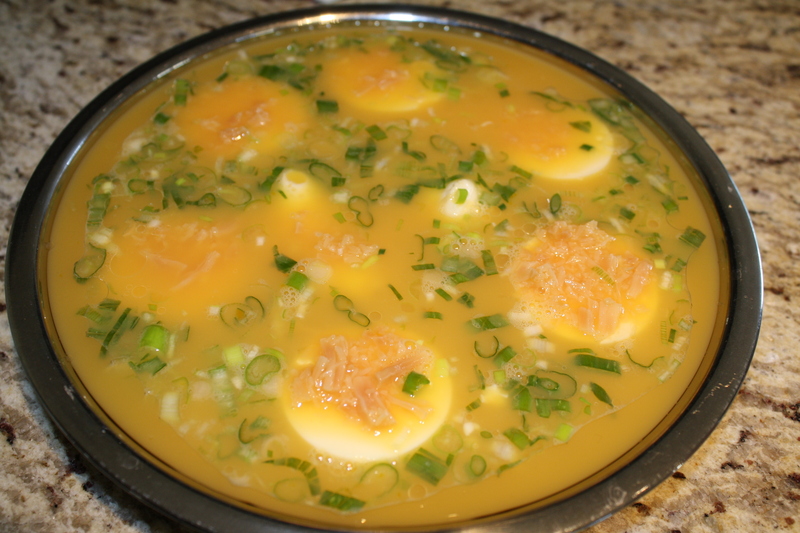 I would never have though of steaming eggs – what a brilliant idea and served with rice reminds me of egg foo yong. your mom seems like such a beautiful person to be around, i love that picture of her with the little ones! Hope you have a great time with the family enjoying time out. Blogging can wait for sure. Lovin’ this tofu dish. A very interesting ingredient the dried scallops. The yins sound like the hackie sack as you say. I had friends in high school who could keep those aloft for hours on end. We really didn’t have that much to do then since the internet had yet to be invented. This tofu egg dish sounds quite lovely. Almost like a Spanish egg torte. You didn’t list the tofu in the ingredients. Did you use just one package? This sounds like something that we’d like. I’ve never used dried scallop though we’ve had dried shrimp in several things. Is the flavor quite intense? Thanks for pointing out the mistake, I’ve corrected it now. Yes, I used one pack of silken tofu. The kind I bought came in a tube-like pack. Dried scallops don’t have a very strong taste to them. They have a slightly sweet seafood taste. That’s why they’re perfect for this dish. They don’t overpower the eggs or tofu because their taste is not too intense. They are more intense in flavour than a regular seared scallop though. Hope that helps to answer your question. I hope I don’t miss the summer-like weather in California in the blink of an eye!!!! I am out almost the whole month of May and can’t wait to be back home!!!! Enjoy your time with the kids and family. That dish brings back so many memories. My grandma used to love making it for us when we were young. I can never get tired of steamed eggs with rice. They are so easy to make yet so delicious. I was gonna ask how to play yins hahaha. Your mom posture (in the pic) makes me laugh 😀 I’ve had and made steamed egg before but don’t think I ever put silky tofu in there. Need to try it! Happy memorial day weekend LeQ! Oh yeah me too – take advantage of good weather as much as possible! Your little ones are adorable!! Take advantage of all the warm weather!! We are doing the same, spending time together outside!! Love the first photo 🙂 This recipe looks good!! I love eggs and tofu!! Hope you are doing well. I love the tofu and egg dish , which reminds me of the one I had at home. My mom always put scallop and shrimp in it, M’mmmm so tasty!! 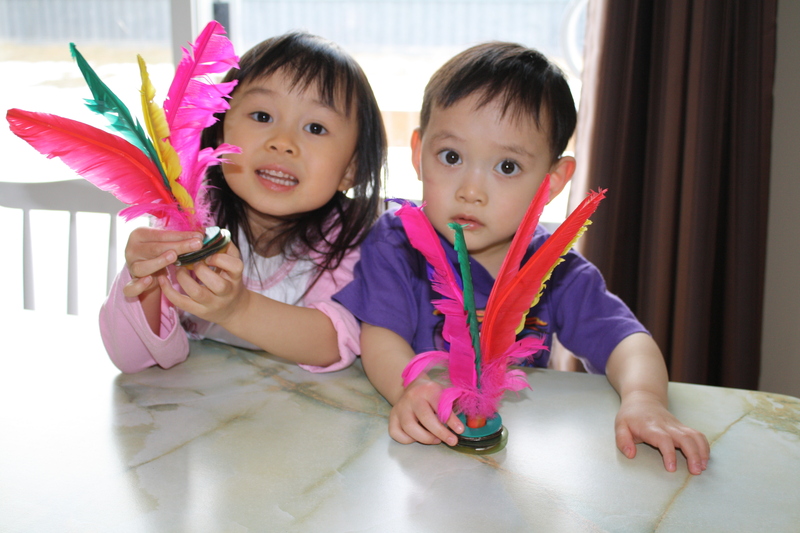 Looking thru those photos took me back to the day of my kids being smaller and I making playdoh for them too. So fantastic. 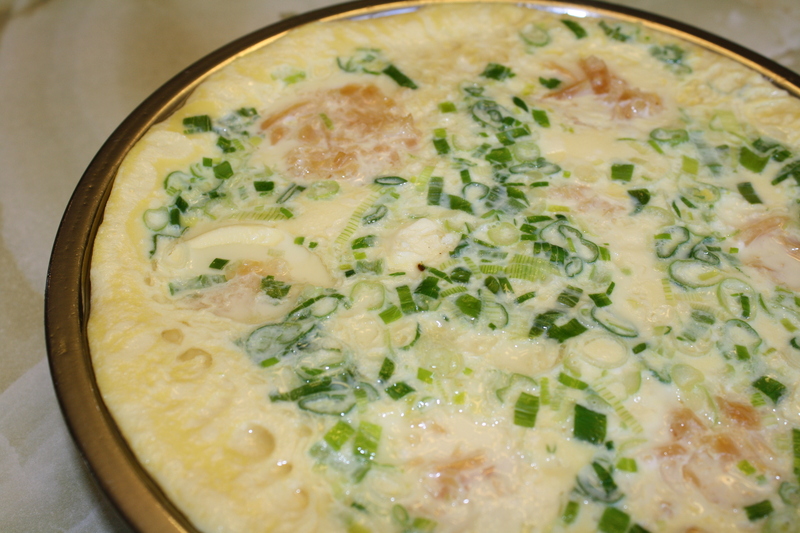 I love the look of your tofu and egg dish. I’d love to take a fork and dig in! What an adorable family! Enjoy your precious time together and make the most of the weather, too. Look at me – days and days later – finally reading your post. I have left it open here since you wrote it. Finally! What gorgeous photos of your treasures, first. How wonderful, LeQuan, that you have developed a relationship with your cyber friend to the extent of her sending your children these incredible hacky sacs. I can certainly see how confusing it would be to understand how to use them with the gorgeous feathers protruding from them. I have never seen any with feathers before! Great idea for the dried scallops. The recipe looks really delicious, flavourful and quite straightforward to make. I think even I could do it with these instructions!… and I usually do not have that level of confidence with most of the dishes you share here! I just cannot get back into reading and blogging. I am in a serious slump. I miss it, yet am very unable to get to it. Certainly, there is a not so quiet inner struggle about this going on with me right now. BUG HUGS to the kiddies! How is everything going well with you, my dear? I completely understand your last paragraph. I’m going through the same thing as well. Been having a bit of problems trying to find the blogger in me again. Sigh. Plus, the beautiful weather we’ve been having sure isn’t helping much either. Hope all is going well with you. I absolutely love this dish! I find that steaming in very very low heat always give this dish a really nice silky smooth texture and prevents it from “puffing up” with a hardened texture. Thank you for the suggestion. I’ll have to try that next time, and thanks for visiting. My mouth has started watering on such breathtaking pics and recipes on your blog!! You are a great cook and a talented shutterbug. Do visit mine when your time permits.